Text: As we passed the theatre we decided to enter, and hear Miss Stephens sing Scotch ballads to a Scottish audience. Much to our surprise we found the theatre so empty that we obtained seats in the front row. This led to some conversation afterwards relative to the sobriety in the search for amusement which is so characteristic of the people of Edinburgh. Some years ago Catalani gave a concert here. Every place was crowded, and she reaped a rich harvest. The next year she was tempted to come again, and the contrast was most striking; no one who had heard her before went again. When asked the reason, they replied that they had heard her. There was no satire in this, for the same thing occurred with Miss O’Neill. I saw her play, literally, to empty benches, and was able to obtain a seat in the front row. This is the more remarkable, as at her first visit the pressure was so great that people were fainting. All the boxes had been taken previous to her arrival in Edinburgh. I never admired Miss Stephens so much as on this occasion. The small theatre was favourable to her articulation, and I did not lose a word of that pathetic ballad “Auld Robin Gray,” which was rapturously encored, and no wonder, for she sings it with a degree of pathos difficult to describe. There was not a note, nor an intonation, which did not express in its fullest sense the pure feelings and sentiments of that most exquisite piece of poetry. I have always been of opinion that “Auld Robin Gray” affords the best example of female virtue, based on principle and sensibility, to be found in the English language. In a pure mind, like Lady Anne Lindsay’s, the spear of Ithuriel would instantly dissipate the sophism of Rousseau, and depict in their true colours and in their natural deformity the vaunted perfections of his Héloïse. Comments: Frances Lady Shelley (1787-1873) was a well-connected, vivacious British society figure, whose lively diaries (edited by her grandson) include several accounts of theatregoing. Catherine Stephens, Countess of Essex (1794-1822) was an English concert and opera singer and actress. Eliza O’Neill was an English tragic actress (1791-1872). ‘Auld Robin Gray’ is a ballad by Lady Anne Lindsay. The Edinburgh theatre was presumably the Theatre Royal in Princes Street. Text: The Prussians are quartered all over Paris; and wherever they suspect the loyalty of the inhabitants they keep quartering more soldiers upon them. Our men are quartered out of the town – in the Bois de Boulogne – the officers excepted. One evening we went to the Théâtre Feydeau, opera comique. The first piece was ending as we entered the house, and some couplets were sung in praise of Louis XVIII; they were received with violent applause by the whole audience. One man, however, ventured to hiss, whereupon there was a great disturbance, and the individual in question was thrown out of the pit. The couplets were then encored amid tumultuous expressions of delight. It was a moving scene. The petit-pièce was entitled “Richard Coeur de Lion.” The man who represented Blondel had been with the King to Ghent, and was consequently much applauded. He sang well, and with real feeling. When Marguerite in the play said, “Vous etiez avec le Roi,” the cheering was beyond description. I cannot describe the enthusiasm which prevailed throughout the house. The theatre is dirty, the boxes small and insufferably hot. Comments: Frances Lady Shelley (1787-1873) was a well-connected, vivacious British society figure, whose lively diaries (edited by her grandson) include several accounts of theatregoing. At the time of this diary entry, Paris was occupied by British and Prussian troops following the defeat of Napoleon. She saw the opéra comique Richard Coeur-de-lion composed by André Grétry, with a libretto by Michel-Jean Sedaine, at the Théâtre Feydeau. It was an immensely popular work, first performed in 1784, but was not presented in France during the revolutionary period, owing to its royalist theme. Vulgarity is an implicit element of the true music-hall. . . . Out of the vulgarity of the people did the music-hall arise, nor will anyone be so foolish as to contend that, by tampering with its foundations, we shall go one step towards refining the people. That delicate and penetrative writer, Dixon Scott, imagines in one of his playful essays the more than cosmopolitan Mr Walkley for the nonce desorienté. The Five Towns it is which bring to a disconcerting standstill this “picked man of countries.” “Where are they?” he asks wearily and a trifle shamefacedly, after the manner of a schoolboy stumped for the whereabouts of Carthage. I, in my turn, no “student of the drama” since there is little on the English stage left to study save Mr Oscar Asche’s sham orientalism and Mr Hichens’s real camels, must confess to a singular ignorance of theatrical activity outside the quarter-mile radius. “Where is Collins’s?” and “Who is Mr George Carney?” would therefore have risen naturally to my lips, and not at all in the judicial manner, pour rire, when a youth, engaged in mending my bicycle, hopelessly confused his tale of the machine’s defects with references to a place called Collins’s, that fellow Carney, and a certain history confided by some colonel to his adjutant. Would have risen to my lips, I say – but here some explanation is necessary. I have from youth up cherished an extreme dislike for lack of definition in the things that matter, and an equal repugnance for a pedantic accuracy in the things which do not matter at all. I abhor all those befogged conceptions and blurred declarations of faith which are the stock-in-trade of half the philosophers and three-fourths of the clergy. Tell me definitely that Space is curved and I will believe it, though truth wear a German complexion. Deny that Space is curved, and certify the same on the Royal Society’s proper form for denials, and I will consider to which camp I will belong. But let there be no “iffing and affing,” as they say in Lancashire. It annoys me that people can turn the careless side of their intelligence to such fundamental affairs as Time and Space, the nature of matter, the impasse of a self-existent or a created universe, whilst taking the most passionate interest in such trivia as dates and places, the addresses of tradespeople and the hours of trains. I do not ever hope to remember the name or number of the street in which I live, nor have I for years been able to discriminate between the keepers of my lodging- houses. All landladies are one, co-equal, co- eternal and co-incomprehensible. I hate to decide what I shall do on Saturday, to determine whether the air will be fresher at Ramsgate or Margate, Southend or Clacton-on-Sea. I am in complete ignorance of the geography of London, and invariably take what is called a hackney coach from King’s Cross to St Pancras. I have for many years left the choice of place of amusement to the discerning cabby. “Anywhere you like,” say I, “except Chu Chin Chow. Wherever one may be set down, the prime condition of life will be fulfilled — to see yet more of an amusing world and its humanity. Few people have shown a more philosophic appreciation than Bernard Clark and Ethel Monticue when they “oozed forth” into the streets. The phrase accurately describes my first attempt to find Collins’s music-hall. I had always “placed” Collins’s as lying vaguely south of the river, somewhere between the Elephant and the Obelisk, Now the game of inattention to the trivialities of life has its rules, and one of them is that having made your intellectual bed so you must lie on it. You are to have the courage of your lack of mental industry. You have not attended to the lesson; you may not crib the answer. To dine at Princes’ and bid the commissionaire whistle an instructed taxi were outside the code. No; I had placed Collins’s near the Obelisk, and near the Obelisk I must find it, first dining befittingly and then oozing forth afoot. This may not be the place to describe a dinner “at the Obelisk.” Sufficient to say that if the cuts were not prime, the manners of my fellow-guests undoubtedly were. They did their meal the courtesy of being hungry; they ate, but not because it was the polite hour. They made no conversation, because they were not afraid of silence. My neighbour, an itinerant musician — in plain English he played a fiddle in the gutter — was, I judged, a man of uncertain character, but definite education. He forbore to relate his history. I discovered that he spoke French perfectly when, apropos of the oeillades of some poor draggle-tail at a neighbouring table, we fell to discussing the efficacy of the Duchess’s revenge in Barbey d’Aurevilly’s story — a good tale, but sadly lacking the American quality of “uplift.” I let slip, as they say, that I was bound for Collins’s, and my friend took occasion to point out that I was very much out of my course. I thanked him and listened to his indications for the following evening, it being a dispensation of the Inattentivists that you are not bound to reject information thrust upon you. We talked until the hour at which a paternal Government decrees that polite conversation in public places shall cease. And separated. But not before my fellow-artist had warmed sufficiently to me to hint that he was “doing well,” and that he hoped next year to enter his son for Eton. Islington I found to be perfectly well informed both as to the locality of Collins’s and the reputation of Mr Carney. If not within a stone’s-throw of the Angel, the hall yet contrives to be at so nice a distance that one may transfer oneself from one house of entertainment to the other without, as old Quex has it, the trouble of drawing on one’s gloves. There is nothing of listless, well-bred indifference in a visit to Collins’s; you must be prepared to take the red plush benches by storm if you would be in at North London’s taking to heart of that rarity among comedians, an actor with a comic sense. I like to watch the curtain go up, having first enjoyed my fill of its bewitching advertisements. I like to watch the musicians file in, to see the flute-player put his instrument together, and that honest workman, the double-bass, spit on his hands, as all honest workmen should. I adore the operation of tuning-up, the precision of those little runs and trills executed in as perfect light-heartedness as the golfer’s preliminary swing. The conductor at these places is a captivating personage; he epitomises the glory of suburbia — dinner jacket, “dickey,” and white, ready-made bow. The overture at Collins’s, perfunctory, gladiatorial, had a familiar air about it, although the programme was not helpful. I should hate to think that a piece with which I am familiar can really be The Woodbine Willie Two-Step. Followed turns of which, or of whom, the chief were a juggler striking matches on his skull, a stout lady with a thin voice, prima donna of some undisclosed opera company, and a Versatile Comedy Four having to do with bicycles. At length and at last, Mr George Carney. The first of his two “song-scenas” is a study of grandeur and decadence, of magnificence on its last legs, dandyism in the gutter, pride surviving its fall; in plain English, a tale of that wreckage of the Embankment which was once a gentleman. He wears a morning coat which, in spite of irremediable tatters, has obviously known the sunshine of Piccadilly, has yet some hang of nobility. The torn trousers still wear their plaid with an air. Enfin, the fellow was at one time gloved and booted. There is something authentic, something inherited, something ghostly about this seedy figure. Trailing clouds of glory does he haunt the Embankment. The ebony cane, the eyeglass with the watered ribbon, the grey topper of the wide and curling brim — all these fond accoutrements of fashion bring back the delightful nineties, so closely are they the presentment, the counterfeit presentment, of the swell of those days. “Bancroft to the life!” we mutter. And our mind goes back to that bygone London of violet nights and softly-jingling hansom cabs, discreet lacquer and harness of cheerful brass—nocturnes, if ever such things were, in black and gold — the London of yellow asters and green carnations; of a long-gloved diseuse, and, in the photographer’s window, a delicious Mrs Patrick Campbell eating something dreadfully expensive off the same plate as Mr George Alexander; of a hard-working Max with one volume of stern achievement and all Time before him; of a Cafe Royal where poets and not yet bookmakers forgathered; of a score of music- halls which were not for the young person. … But I am getting away from Mr Carney. The matter is not very much above our heads — something about a Count who has “taken the count.” The purest stuff of the music-hall, as a music-hall song should be. “There’s a n’ole ‘ere!” pipes with fierce glee the cherub boot-black, bending over the broken boots and abating the deference to the broken swell no jot of his Trade Union rate of “frippence.” How it hurts, the contempt and raillery of this pitiless infant? Enfant goguenard if ever there was one, a capitalist in his small way, and with all the shopkeeper’s scorn of failure. “There’s a n’ole ere!” he insists, and we are reminded of Kipps’s tempestuous friend, “a nactor-fellow.” “Not a n’ole — an aperture, my dear fellow, an aperture,” corrects the noble client, “the boots were patent, but the patent’s expired.” Here the Count drops his cigar and indulges in unseemly scuffle with the urchin. “No, you don’t,” says the riper smoker, regaining possession, “that’s how I got it.” But the child has yet another arrow. “Landlady says as ‘ow you’ve got to share beds wiv a dustman.” But the shaft fails to wound; clearly our hero is of the Clincham mould to whom social distinctions are as “piffle before the wind.” “Want a pyper?” goads the boy, and his client lays out his last remaining copper. He unfolds the sheets and instinctively his eye runs over the fashionable intelligence. “Know Colonel Br’th’l’pp at all?” he inquires. This one recognises as the delightful touch of the man of the world anxious to put a social inferior at his ease. Something after this manner, one imagines, Royalty. “Doing very well in Russia. Was up at Cambridge with his brother, the elder Br’th’l’pp, don’ cher know.” And so to babble of the day’s gossip to the scornful child at his feet. The courtesy, I submit, of one man of polish to another. Night falls, the river puts on its jewels, the result of a cunning arrangement of n’oles and n’apertures in the back-cloth, it draws very cold. More pitiful than the accustomed heir of destitution, but with stiff upper lip, our déclassé shivers, draws his rags more closely about him and moves on. But it is the second song which brings down the house. Here the actor appears as an Army cook, and at Islington we have all been Army cooks in our time. A couple of dixies, the stew in which is discoverable last week’s “Dickey Dirt,” talk of “jippo ” and “the doings ” — all the familiar traffic of the camp rises to the mind’s eye and sets the house in a roar. We are not, we gather, in any theatre of war, but safely at home in halcyon, far-off training days. Almost you can hear the cheerful clatter of the canteen, the thud and rattle of the horse-lines. The wording of the song is in no sense precious. There is a chorus, also serving as corps de ballet, and consisting first of the inveterate grumbler who objects to the presence in his coffee of so harmless a beastie as a “drahned mahse “— the accent is a mixture of Devon and Berkshire with a dash of Cockney. Then comes the superior youth of ingratiating, behind-the-counter manner, the proud possessor, we feel sure, of a manicure set in ivory — does he not abstractedly polish his nails with the end of the towel? After him the “old sweat” who will neither die nor fade away, and lastly our rosy boot-black, now the dear brother-in-arms of the immortal Lew and Jakin. This nucleus of an Army has but a single mind: to know what has become of its blinking dinner. Many and various are their ways of putting it, and it appears that they are no more than Messengers or Forerunners of the cohorts pressing on their heels. But the orderly beguiles their impatience. “What did the Major whisper to the Captain? The orderly is the slipshod, inefficient, imperturbable “bloke” we know so well; with him we are to rise to what Mr Chesterton calls “the dazzling pinnacle of the commonplace.” I am not sure that this is not the best of all this author’s fireworks; it is so stupendous a rocket that the stick has cleared the earth, never to return but to go on whirling around us for evermore. Mr Carney is the embodiment of the commonplace civilian turned warrior. He is the cook who will drop into the stew all manner of inconsidered [sic] trifles: cigarette ash, match ends, articles of personal attire. He is the hero who will be up to all the petty knavery and “lead-swinging” that may be going, who will “work dodges ” with the worst of them, and, on occasion, join with the best in such deeds — he would still call them “dodges” — as shall put terror into the hearts of a ten times outnumbering foe. Of that order of heroic cooks which held Ypres. But it is part and parcel of this actor’s generalship that he will have no truck with heroics. Tell Mr Carney that he raises tears and he will make a mock of you. Or more probably he will continue his song. “What did the Quarter-master tell the Sergeant? “What was the tale the Colonel told the Adjutant? What did the Adjutant say to Major Brown? What did the Major whisper to the Captain? The Captain told the Subs to hand it down. What did the Quarter-master tell the Sergeant? There is a limit to the number of recalls even the most grateful servant of the public may permit himself, and at last Mr Carney is allowed to retire in favour of the next turn. But my friend on the right takes some little time to simmer down. “Good ole George!” he continues to mutter under his breath. “Oh, good ole George!” And as the tumblers who come next are a dull pair, I wend my way out. Comments: James Agate (1877-1947) was a British theatre critic, essayist and diarist. George Carney (1887-1947) was a British music hall entertainer and film actor, particularly known for his portrayal of working class characters. Collins’s Music Hall was located in Islington, London, and had a history going back to 1794. It ceased operating after having been damaged by fire in 1958. Mr Walkley is the theatre critic Arthur Bingham Walkley. Bernard Clark and Ethel Monticue are characters from Daisy Ashford’s juvenile novel The Young Visiters, as is the Earl of Clincham. Bancroft refers to the Victorian actor-manager Squire Bancroft. Lew and Jakin are drummer boy characters in Rudyard Kipling’s story ‘The Drums of the Fore and Aft’. Text: It was the first night of “The Possessed” at the Moscow Art Theatre. I had been warned to be in my seat at eight o’clock as it is the custom at the Moscow Art Theatre to close the doors at that hour and allow no one in the auditorium after the play has begun. So I arrived early for I was anxious to study the audience at this famous theatre in the heart of the Czar’s dominions. A few minutes in the foyer were sufficient to convince me that the first performance of the Dostoyefsky drama would be witnessed by a gathering of “intellectuals.” There were no gorgeous uniforms, no elaborate gowns. Less than a dozen persons were in evening dress. Yet the orchestra chairs were five roubles ($2.50) each. A warning bell sent me hurrying to find my seat. I was just in time for the doors were being closed. A few moments later — promptly at eight o’clock — the lights were dimmed and the curtain rose. There was no overture. In fact, there is no orchestra pit in the Moscow Art Theatre. When music is needed it is played under the stage. “The Possessed” proved to be a succession of detached scenes from Dostoyefsky’s novel of the same name rather than its dramatization. The Moscow Art Theatre is equipped with a double decked revolving stage which enables scene to follow scene with only the darkening of the auditorium for a few moments to punctuate the intervals. Unlike most revolving stages it moved noiselessly. The acting was magnificent. Although I did not understand a single word that was spoken I was able to follow the story of the play. What higher praise can be accorded actors! I expected an outburst of applause at the end of the act but when the curtain fell the greater part of the audience silently left their seats for the foyer-promenade. Applause is never accorded the artistes at the Moscow Art Theatre. Nor are curtain calls ever allowed. Realism and naturalness above everything else are striven for. During the second act M. Stanislauski [sic], one of the directors of the theatre, took me behind the scenes to see the double decked revolving stage in operation. There I met three Russian priests who were watching the performance. Priests in Russia are forbidden to attend theatrical performances but many of them visit the Moscow Art Theatre and witness the performances from the wings, safe from the public gaze. M. Stanislauski showed me through the dressing rooms which are so arranged that the male and female players do not meet until they reach the stage made up for their parts. They have separate green rooms and separate exits. In no theatre in the world is the comfort of the actor given so much attention. At the end of the second act I was presented to Madame Knipper, the widow of the famous Tchekoff, who was enacting the leading role in the new play. I also had the honor of shaking hands with Mlle. Koreneff and M. Katchaloff, two other leading players. A first night in most playhouses is a nerve-racking affair — neither players nor managers have time for idle conversation. But at the Moscow Art Theatre a first performance after three months of rehearsals runs as smoothly as clockwork. Never has the old adage, “Great oaks from little acorns grow,” been better exemplified than by this unique theatre. Beginning as an amateur theatrical society, without funds or wealthy members, it has become in little more than a decade one of the foremost theatrical organizations in the world. Its home is the best equipped playhouse in Europe. And its productions are the most perfect given on any stage. Although in Russia the Moscow Art Theatre is looked upon as the first theatre in the land it is almost unknown outside of the Czar’s Empire, except in Germany. Its company has only appeared in the leading cities of Russia and a few of the larger German capitals. Moscow is so far off the beaten track of travel that few American writers on theatrical subjects visit it. And naturally, as Russian is understood by so few people interested in the drama, the Moscow Art Theatre must remain “a thing apart.” But its influence is already so great that no one interested in theatrical affairs can afford to be ignorant of it, or to ignore it. 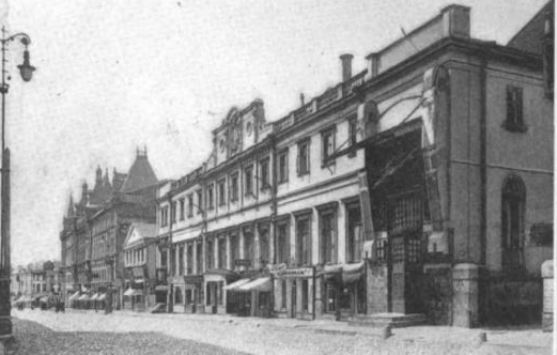 The Moscow Art Theatre was the first playhouse in the world to have a double decked revolving stage. Prof. Max Reinhardt adopted the idea for the Deutsches Theater in Berlin, and later the idea was copied by the designer of the New Theatre in New York (now the Century Opera House). But it is in the conduct of the theatre and its productions that this playhouse is the most interesting. It is a co-operative organization owned by thirty-one actors and actresses, who appear on its stage. The entire organization consists of 360 men and women who devote their time exclusively to the artistic, financial and operating side of the playhouse. In addition to its two directors, who have practically equal responsibility, there is a governing board that passes on all important matters. After ten years’ service an actor or actress becomes a shareholder, and there is a pension system for superannuated players, as well as funds for cases of emergency. Every player is given ten weeks’ vacation with pay — their services being contracted for by the year. Thus it will be seen that from the actor’s standpoint the Moscow Art Theatre is about ideal. Only three new productions are made each year. However, a repertory of twelve is given, former successes being repeated as often as the receipts warrant. At least three months are devoted to the preparation of each play. Consequently only finished productions are given. While the theatre is the home of the Russian drama, the dramas of other countries are not neglected. Shakespeare, Ibsen, and Hauptmann are almost as much in evidence as Tolstoy, Gorky, Gogol and Tchekoff. It is very difficult to obtain a seat for a new production at this unique theatre. For the first ten performances of each new play every seat is subscribed for, which, of course, gives the theatre working capital. The expenses of the organization are about $350,000 a year, but as its receipts are always over $400,000 it is very prosperous. However, it makes very little money in Moscow, where a full house means only $1,500. Its season in Petersburg, where it plays in the Imperial Mikhailovsky Theatre (the Royal French Theatre) means $4,000 a night, and in Kieff, Warsaw and Odessa it plays to enormous business. The third act was on before M. Stanislauski and I returned to the auditorium. Of course he was able to pass the closed doors and he sat with me until the final curtain fell. “Is it a success?” I asked as we emerged to the brilliantly lighted foyer. Moscow is one of the few cities in the world that takes its dramatic critics seriously. Comments: Karl Kingsley Kitchen (1885-1935) was an American travel writer, newspaper columnist and bon viveur. The Moscow Art Theatre company (MAT) was co-founded by Vladimir Nemirovich-Danchenko and Konstantin Stanislavski, and was highly influential in its advocacy of naturalistic theatre, making its mark in particular with the plays of Anton Chekhov. The production of Nemirovich-Danchenko’s Nikolai Stavrogin, an adaptation of Dostoyevsky‘s novel The Possessed, became controversial after it stirred Maxim Gorky to write vehement articles in protest at MAT’s staging of a reactionary novel. The performers included Olga Knipper, widow of Anton Chekhov and Vasili Kachalov. A different version of this essay was published as ‘Moscow Art Theatre’ in the American journal, The Theatre, vol. 20, 1914. The Nellie Farren benefit was the finest thing I have seen this year past. It was more remarkable than the Coronation, or the Jubilee. It began at twelve o’clock on Thursday, but at ten o’clock Wednesday night, the crowd began to gather around Drury Lane, and spent the night on the sidewalk playing cards and reading and sleeping. Ten hours later they were admitted, or a few of them were, as many as the galleries would hold. Arthur Collins, the manager of the Drury Lane and the man who organized the benefit, could not get a stall for his mother the day before the benefit. They were then not to be had, the last having sold for twelve guineas. I got two the morning of the benefit for three pounds each, and now people believe that I did get into the Coronation! The people who had stalls got there at ten o’clock, and the streets were blocked for “blocks” up to Covent Garden with hansoms and royal carriages and holders of tickets at fifty dollars apiece. It lasted six hours and brought in thirty thousand dollars. Kate Vaughan came back and danced after an absence from the stage of twelve years. Irving recited The Dream of Eugene Aram, Terry played Ophelia, Chevalier sang Mrs. Hawkins, Dan Leno gave Hamlet, Marie Tempest sang The Jewel of Asia and Hayden Coffin sang Tommy Atkins, the audience of three thousand people joining in the chorus, and for an encore singing “Oh, Nellie, Nellie Farren, may your love be ever faithful, may your pals be ever true, so God bless you Nellie Farren, here’s the best of luck to you.” In Trial by Jury, Gilbert played an associate judge; the barristers were all playwrights, the jury the principal comedians, the chorus girls were real chorus girls from the Gaiety mixed in with leading ladies like Miss Jeffries and Miss Hanbury, who could not keep in step. But the best part of it was the pantomime. Ellaline came up a trap with a diamond dress and her hair down her back and electric lights all over her, and said, “I am the Fairy Queen,” and waved her wand, at which the “First Boy” in the pantomime said, “Go long, now, do, we know your tricks, you’re Ellaline Terriss”; and the clown said, “You’re wrong, she’s not, she’s Mrs. Seymour Hicks.” Then Letty Lind came on as Columbine in black tulle, and Arthur Roberts as the policeman, and Eddy Payne as the clown and Storey as Pantaloon. Greene and Ben Davies sang as street musicians and the clown beat them with stuffed bricks. After that there was a revue of all the burlesques and comic operas, then the curtain was raised from the middle of the stage, and Nellie Farren was discovered seated at a table on a high stage with all the “legitimates” in frock-coats and walking dresses rising on benches around her. The set was a beautiful wood scene well lighted. Wyndham stood on one side of her, and he said the yell that went up when the curtain rose was worse than the rebel yell he had heard in battles. In front of her, below the stage, were all the people who had taken part in the revue, forming a most interesting picture. There was no one in the group who had not been known for a year by posters or photographs: Letty Lind as the Geisha, Arthur Roberts as Dandy Dan. The French Girl and all the officers from The Geisha, the ballet girls from the pantomime, the bare-back-riders from The Circus Girl; the Empire costumes and the monks from La Poupee, and all the Chinese and Japanese costumes from The Geisha. Everybody on the stage cried and all the old rounders in the boxes cried. It was really a wonderfully dramatic spectacle to see the clown and officers and Geisha girls weeping down their grease paint. Nellie Farren’s great song was one about a street Arab with the words: “Let me hold your nag, sir, carry your little bag, sir, anything you please to give – thank’ee, sir!” She used to close her hand, then open it and look at the palm, then touch her cap with a very wonderful smile, and laugh when she said, “Thank’ee, sir!” This song was reproduced for weeks before the benefit, and played all over London, and when the curtain rose on her, the orchestra struck into it and the people shouted as though it was the national anthem. Wyndham made a very good address and so did Terry, then Wyndham said he would try to get her to speak. She has lost the use of her hands and legs and can only walk with crutches, so he put his arm around her and her son lifted her from the other side and then brought her to her feet, both crying like children. You could hear the people sobbing, it was so still. She said, “Ladies and Gentleman,” looking at the stalls and boxes, then she turned her head to the people on the stage below her and said, “Brothers and Sisters,” then she stood looking for a long time at the gallery gods who had been waiting there twenty hours. You could hear a long “Ah” from the gallery when she looked up there, and then a “hush” from all over it and there was absolute silence. Then she smiled and raised her finger to her bonnet and said, “Thank’ee, sir,” and sank back in her chair. It was the most dramatic thing I ever saw on a stage. The orchestra struck up “Auld Lang Syne” and they gave three cheers on the stage and in the house. The papers got out special editions, and said it was the greatest theatrical event there had ever been in London. Comments: Richard Harding Davis (1864-1916) was a celebrated American journalist and novelist, known for his war reporting and sharp eye for a sensational subject. Ellen ‘Nellie’ Farren (1848-1904) was a British actor and singer, renowned for her principal boy performances in Gaiety Theatre productions, which attracted a huge, chiefly male, following. She was forced to retire through ill health in 1892. On 17 March 1898 a performance in aid of the Nellie Farren Testimonial Benefit Fund at Drury Lane drew an unprecedented cast of late Victorian stage greats, and raised an estimated £7,000. The show included a production of Gilbert and Sullivan‘s one act comic opera Trial by Jury, with Gilbert himself playing the Associate. Other accounts of the event state that Dan Leno appeared in a scene from the Drury Lane pantomime with Herbert Campbell, and not a scene from Hamlet. Text: At Turin, to turn to one of the lesser capitals, there are a number of theatres, but among them the one which rises most distinctly before my mental vision, is the Teatro Carignano, a playhouse which may possibly be quite as old as the Valle, but which is infinitely superior to it in interior beauty. The Carignano of course follows the old pattern, with its box-fronts rising tier above tier to the very dome, — the only pattern of theatre which was known in Europe a century ago. In this particular it resembles the Valle, but where the Roman interior is dreary and bare this is covered with elaborate decoration. The whole surface of the box-fronts seems to be overlaid with gold-leaf subdued to a dull lustre, and in this series of gilt frames the occupants of the boxes are set off in picturesque relief against the deep crimson hangings. Up on the ceiling some clever hand has painted a flight of graceful figures in soft colors, forming a suitable and harmonious piece of decoration. The drop-curtain is not occupied with advertisements but is ornamented — or was as I remember it — with a Venetian picture, showing a high terrace in the foreground and a stretch of lagoon under a sunset sky behind. It was in this theatre that we first saw Eleonora Duse — saw her in one of those pitiful plays of modern social life of which Camille is the prototype and which has had, alas, so many, many after-types. As we went to the Carignano that evening we found ourselves wondering what particular shape the unfortunate happenings of the play would assume. Would the husband or the wife be the criminal? And how would the wife die in the last act? For that she would come to a tragic end in one way or another, there was little room to doubt. Our preconceptions of what the stuff of the drama would be were, as it proved, wholly justified. It happened to be the husband who was unfaithful, — and the wife’s suffering, which commenced with the first rising of the curtain at nine o’clock, was continued until midnight, and ended finally in suicide. A very large and very representative audience, containing elements from every section of Turinese society, and delegations of reporters from other cities, went to listen to the unhappy tale and showed their appreciation of it by frequent applause while the scenes were in progress and by clamorous recalls after each descent of the curtain. One of the notable features about the tragedienne’s acknowledgment of these noisy plaudits was that she never for a moment issued from her role. If the applause continued persistent after the descent of the curtain, as it generally did, a door would open from the subterranean recesses of the Venetian terrace and the slight and frail-looking figure would come into view. A few sad steps would be taken with a melancholy smile before the footlights and the sorrowful figure would disappear through the other door. There were none of the grimaces by which the “artist” in general seeks to compensate the audience for the honor of its approbation. The unity of the role was never once broken. The note of tragedy was consistently maintained. It was Flavio Ando who sustained the second rôle on this particular evening, — an ungrateful part which, used as he is to rendering such characters, he must have disliked to assume. Possibly this excused or explained his imperfect memorizing of his lines, which at certain points rather marred the effect of his acting. The rôle of the prompter has not become a wholly superfluous one in Italian theatres, and on this particular evening the invisible man in the hooded box had to recite many passages of the second actor’s part. It was, to say the least, trying to the nerves of the listeners to hear the words which Ando was to utter, hissed out in a more than audible whisper, before they were taken up by the actor himself; and at certain points where this halting echo was supposed to represent an impetuous and spontaneous outburst of passion the effect bordered on the ridiculous. As to the acting of the heroine, the distinctive quality in it which impressed us at that time, and which has re-impressed us on every occasion when we have heard her since, was its poignant naturalism. She seemed to be not so much putting on agony as actually suffering. The absence of conventional gestures was one of the incidents of her art which contributed very much to this general effect. Intonation was much. The perfect naturalness of the tone and the total suppression of the declamatory and rhetorical counted for a great deal. But the avoidance of “gestures” in the technical sense, certainly had its share. Eleonora Duse as we all know does not keep her hands still. She does not walk about with them glued to her side. But what she does with them is what a natural woman does. She smooths out the folds of her dress. She arranges her hair. She does a thousand and one things which are feminine, which are human, which are natural; and she does not wave them and pose them in the flourishes and the curves which have so long been favored by the artificial persons of the stage. Comments: Ashton Rollins Willard (1858-1918) was an American art critic, who specialised in Italian art. This extract comes from a chapter on theatres in a his travel book on Italy. The Teatro Carignano in Torino opened in 1753. Eleonora Duse (1858-1924) was an Italian actress of worldwide renown, the performances celebrated for the depth of their sensitivity. She performed in this unidentified production alongside the Italian actor Flavio Andò (1851-1915).